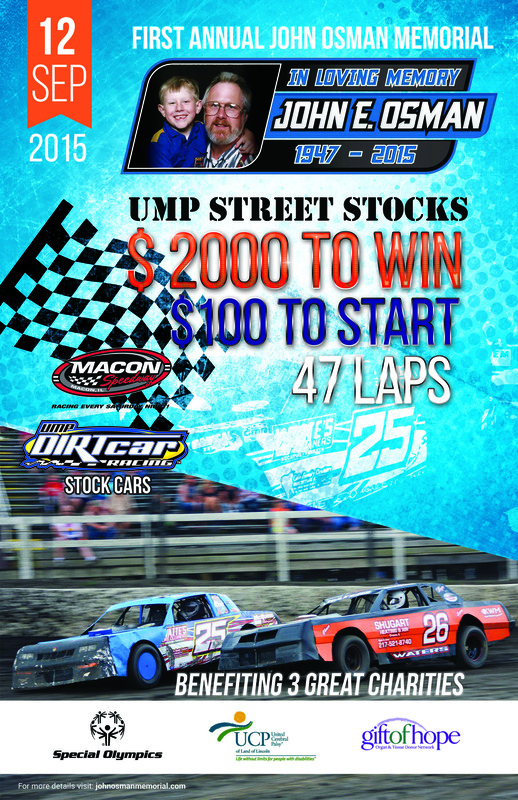 Only four events now remain on the Macon IL Speedway schedule and the UMP Street Stocks have a big one is this coming Saturday, September 12. It will be the Inaugural John Osman Memorial, paying a $2,000 top prize to the winner. Four other divisions will also pace the high banked 1/5-mile. John Osman, a long-time car owner and overall race enthusiast, passed away earlier this season. Osman was still the car owner and car chief for his son Greg’s #25. Greg Osman, who is a regular competitor in the UMP Street Stock division at Macon Speedway and with the Midwest Big Ten Series, decided to put together a race to honor his dad for all that he has done for racing. The John Osman Memorial has in upwards of 30 drivers pre-entered with a number of other possibilities expected. The payout is quite large for the event, paying $2,000 to win and $100 to start. Drivers will have qualifying, heats, and a last chance race to set the starting field. The fast qualifying and dash winner will receive $100 bonuses. The event will benefit Gift Of Hope, an organ and tissue donor network, the Special Olympics, and United Cerebral Palsy of Land of Lincoln. For more information about the race and charity, visit johnosmanmemorial.com. In addition to the Street Stocks, the Big Ten Pro Late Models, Billingsley Towing UMP Modifieds, UMP Hornets, and UMP Sportsman are on the schedule. Pit gates will open at 4:00, grandstands at 5:00, hotlaps begin when the pill draw ends at 6:00, and racing will take the green at 7:00. Admission prices are $12 for adults and free for children 11 and under.